It's just one piece of a massive PR blitz. With the final episodes of Mad Men to begin airing on April 5, the show’s PR machine is in full effect. But it’s not just your run-of-the-mill posters and social media that’s being used to bring out viewers. In New York City, you can sit next to Don Draper on a bench that features his iconic outline. Located in front of the Time & Life Building where the fictional Sterling Cooper & Partners is located, “The Draper Bench” will be in place through the summer. 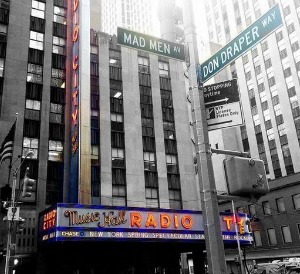 There’s also Mad Men Ave and Don Draper Way in front of the famous Radio City Music Hall. As one of my colleagues pointed out, the fact that the show is about media and it’s so popular among media is helping to generate more attention for the program. After all, when the last season debuted last year, it actually lost one million viewers versus the previous season. So it’s not sheer popularity, as in the case of Empire, that’s driving all the activity. And perhaps it’s another case of New Yorkers living in their own bubble. We’re in Manhattan, the show is largely set here and we’re excited to see it and relate to many aspects of it. We’re surrounded by Mad Men stuff where people in other cities probably are not. But largely, Mad Men is a damn fine show and to see it go is difficult, even with a ton of other shows still to keep up with. We’d bet a whole dollar that those ratings for the April 5 premiere will jump back up. We can’t wait.